The Legacy of the Lakes Museum (formerly named Minnesota Lakes Maritime Museum) in Alexandria has many exhibits that are enjoyable to visit again and again. One of them exhibits the Grand Hotels and Resorts that were in Alexandria. 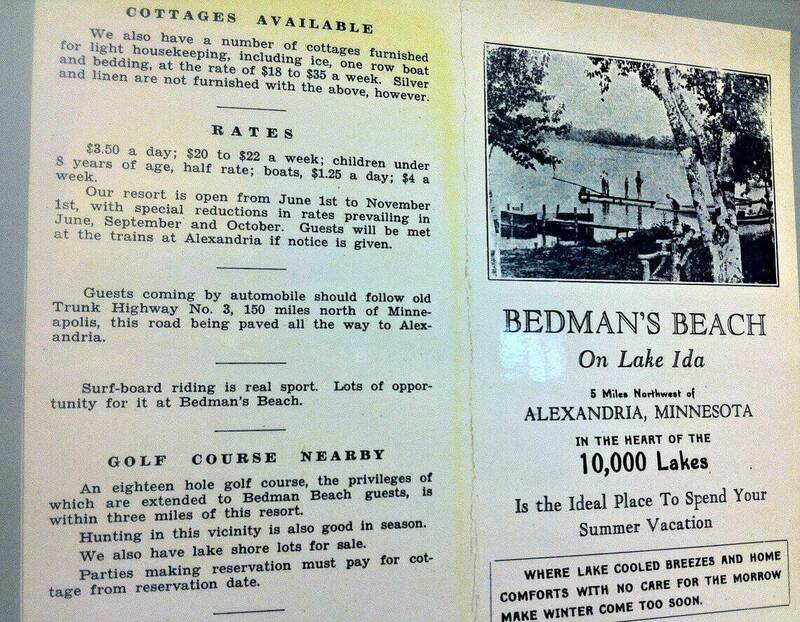 I took this photo of a brochure from Bedman’s Beach Resort at Lake Ida. Ah, the days of $20 – 22 a week at the lake. My favorites from the brochure are “Surf-board riding is a real sport” and “Where lake cooled breezes and home comforts with no care for the morrow make winter come too soon”.